Features	: spacious furnished 1 bedroom apartment. 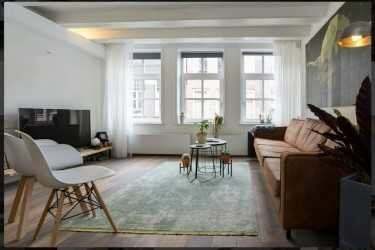 On an authentic place in the Centre of Amsterdam is this 1-bedroom House of approximately 70 m2. The property is located on the 2nd floor in a monumental building very modern and luxurious inside and equipped with all amenities and double-glazed Windows and central heating. the Rapenburg is situated in a unique location in the Centre of Amsterdam, a central yet very quiet living. Absolutely everything is within walking distance, such as the bustling downtown with cafés, shops and nightlife, while its intimate character. The Nieuwmarkt square, Dam square, the Kalverstraat, the waterlooplein, the Rembrandtplein, the Stopera, the Plantation quarter with Artis and the Hortus, the Oosterdok with the OBA and the Conservatory and many museums are all within walking distance. In addition, the compounds be called excellent public transport 7 minutes walking there are two metro stations (Nieuwmarkt and Waterloo) 15-minute walk takes you to the Central Station. 2nd floor: entrance hall with wardrobe, large closet with laundry and the HR CV combi boiler. The sunny living room with modern open kitchen is located on the water side. The kitchen is equipped with appliances (dishwasher, microwave oven, four-burner gas cooker). The spacious bedroom is located at the rear. Modern bathroom has a bathtub, sink and toilet. The living room and bedroom have a beautiful wooden floor. The living room and bedroom are provided with beautiful wooden flooring. The other rooms are tiled. Fridge, sofa and dining table and washing machine are optional if you like to have it in the house.